If someone were to tell me they thought tonight’s Rebecca/Kate storyline was unbearably trite, I wouldn’t really be able to argue with them. Its central characters are thinly drawn, its central conflict is ill defined, and its writing—particularly in the 1980s flashbacks—wouldn’t feel out of place in an after school special. And yet even though I can intellectually see all those flaws, that didn’t stop the whole thing from working like gangbusters for me. Part to that is because the show utilizes the ultimate emotional cheat code by setting a montage to “Landslide.” But another part reflects the powerful alchemy of This Is Us: The show offers an ensemble of inherently likable characters played by even more likable actors and puts them in broad conflicts that are easy to project your own life on to. The golden rule of writing is that it requires specificity to feel universal, but This Is Us somehow manages to subvert that advice without losing its emotional heft. Perhaps I’m being a little unfair when I say This Is Us is lacking in specificity. The unusual makeup of the Pearson family alone imbues the show’s storytelling with inherent specificity. But as much as it’s trying to tell the story of the Pearson family in particular, This Is Us is also trying to be a show about families in general. This is an episode about Rebecca and Kate’s relationship, but it’s also one that’s meant to resonant with any fraught mother/daughter relationship. How well it works on you will likely come down to how well you inherently relate to that premise. For me, at least, I relate deeply to the idea of feeling a constant sense of oil and water friction in a parental relationship that’s also filled with love and understanding (although with me it’s with my dad and not my mom). So whatever shortcuts This Is Us takes to get us to the Rebecca/Kate confrontation scene, I’m able to gloss over as I fill in details from my own life. Why is Kate so indiscriminately hostile towards Rebecca? For all the reasons I’m so indiscriminately hostile towards my dad at times—reasons I don’t even fully understand. Because art is subjective, it’s impossible for me to say how well the Rebecca/Kate storyline would play for someone who doesn’t inherently relate to its premise. But This Is Us also stacks the deck by filling each episode with a bunch of different storylines. Don’t relate to the Rebecca/Kate tension? Well maybe you’ll see yourself in the Jack/Kate dynamic or the Randall/Beth one or the Kevin/Sophie one instead. Of course, there are things to like about the Rebecca/Kate storyline regardless of whether you explicitly see yourself in it or not. The most interesting of which is how This Is Us utilizes its multiple timelines to humanize both characters. Plenty of shows have had complicated, compelling mother/daughter relationships before (I’m thinking particularly of Lorelai and Emily in Gilmore Girls), but what makes This Is Us unique is the way it allows us to sympathize with both women on an equal playing field. Gilmore Girls conjured up tons of empathy for both Lorelai and Emily over the course of its run, but we always saw them from the same perspective: A grown daughter and her uptight mother working through the pain of the past. The time jumps allow This Is Us to present Rebecca and Kate as protagonists in their own separate but related stories. That forces the audience to continually shift its perspective and sympathies between the two. The moment during the aforementioned “Landslide” montage that made me cry the hardest (and believe me, there was a lot of crying on my end) was the one that juxtaposes a smiling young Rebecca watching her nine-year-old daughter sing at the kitchen table with a smiling older Rebecca watching her 37-year-old daughter perform onstage for the first time as a professional singer. That’s This Is Us in a nutshell: The past relates to the present in the ways that are equal parts beautiful and heartbreaking, frustrating and joyful, ephemeral and permanent. Rebecca put her singing dreams on hold to become a full-time mom and now she gets to watch her daughter live out that dream instead. But she also has to deal with Kate’s lifelong resentment too, which stings all the more because of how much Rebecca gave up to raise her. In addition to continuing the premiere’s trend of deepening the show’s female characters, “A Manny-Splendored Thing” also continues to use the same structural inventiveness when it comes to the show’s timelines. The episode opens on Rebecca and Jack’s tentative reunion in 1996 before Rebecca’s question about Jack’s past experience with alcoholism launches us back into 1989 and the events surrounding the first season episode “The Big Three.” Back then Jack was able to shake off his addiction on his own terms by using his family as motivation. This time around he recognizes he’ll need support not only from Rebecca and an alcoholics anonymous group, but from his kids as well. It’s a pretty straightforward story, but the “flashback within a flashback” structure gives it added weight. But This Is Us also goes ahead and throws a few more timelines into the mix too as Jack works through his problems in a boxing gym during the “Landslide” sequence. Much as Kate did during her cathartic drumming experience back in “Three Sentences,” Jack flashes back to the events of his life that shaped his own relationship to alcohol, namely his father’s drinking and his own time in Vietnam. 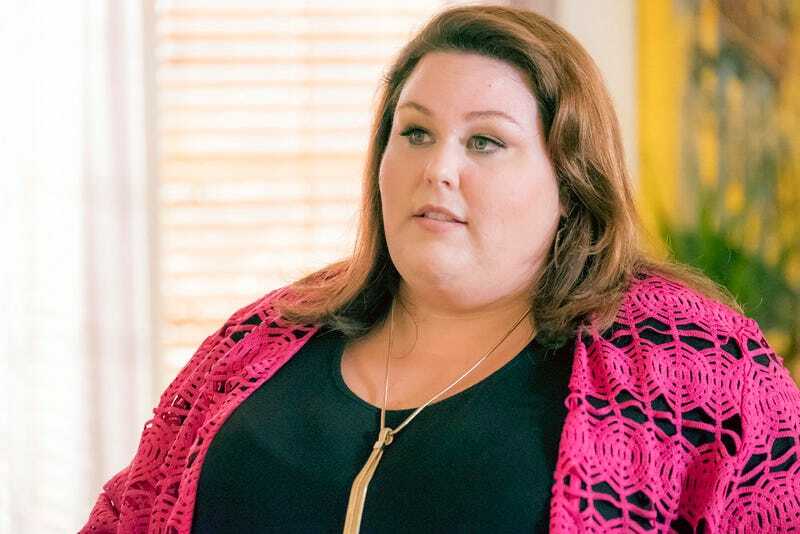 This Is Us has a habit of over-monologuing, which is why its best sequences tend to be montages. And the “Landslide” sequence is no exception, particularly because of the way it utilizes the passage of time. As a kid all Kevin wanted to do was impress Sophie. Grown up Kevin is now realizing that’s all he really wants too. This whole episode is about characters facing the fear of failure only to find strength in the people they love, as Kevin does with Sophie. So it’s certainly no accident that Kate’s aborted talent show song is “Lean On Me.” When he’s in pain, Jack turns to Rebecca and Kate to remind him there’s always tomorrow. And when Randall and Beth need a hand, they lean on each other. But try as they might, Kate and Rebecca just can’t seem to be the support system the other needs. Theirs isn’t a relationship with the simplicity of “Lean On Me,” it’s one with the complications of “Landslide.”And it’s nice to see This Is Us explore a relationship dynamic that doesn’t have easy answers for once, particularly when it puts its two female leads front and center. As they are wont to do, Randall and Beth have a really fantastic storyline tonight. As Randall “Randalls out” about the idea of fostering an older kid, Beth turns to Kevin, of all people, for support. The whole thing is sweet, funny, and beautifully played by both Sterling K. Brown and Susan Kelechi Watson, who might have the best collective arms of any TV couple. Kevin revisits his role on The Manny in what I think is mostly just an excuse to get the whole Pearson crew on the West Coast. So far, Kevin and Sophie’s reunion has been suspiciously smooth sailing so it’s only a matter of time before the other shoe drops. This episode is hands down the most I’ve ever liked Toby. His comedy is toned down, his supportiveness is turned up, and he serves as a perfect buffer in the Rebecca/Kate conflict. Plus his eagerness to bond with Miguel was wonderfully endearing. We get our first glimpse of Jack’s time in Vietnam, which I have to imagine will be fodder for another flashback later in the season unless This Is Us rented a helicopter for just that one shot. I’m really starting to appreciate Justin Hartley as a comedic actor and his apathy towards Miguel’s selfie really made me laugh. Similarly, Mandy Moore beautifully played Rebecca’s uncertainty over how to respond to Kate’s announcement that the dipping sauce was made with nut cheese.